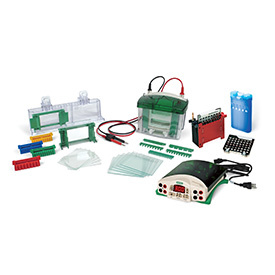 The Mini-PROTEAN Tetra Cell for handcast gels (1658001), Mini Trans-Blot Cell (1703935), and PowerPac Basic Power Supply (1645050) are bundled together in this offering. The Mini Trans-Blot Cell provides rapid, high-quality blotting of two Mini-PROTEAN Precast Gels or handcast gels. The cell accommodates two color-coded gel holder cassettes for simultaneous electrophoretic transfer and is used in the Mini-PROTEAN Tetra Cell tank. The PowerPac Basic Power Supply is a high-quality power supply that offers simple programming, timer control, constant voltage or current output, and the ability to pause and resume a run. The PowerPac Basic Power Supply is intended for basic applications such as submerged horizontal and mini vertical gel electrophoresis but it also provides sufficient output to support the Mini Trans-Blot Cell.